Advance, Promote, and protect the science and practice of behavior analysis. CalABA will have an informed and engaged membership, a well-developed organizational infrastructure, and a wide sphere of influence. As members of the behavior-analytic community, we are committed to these core values in our interactions with each other and our stakeholders. The mission of the California Association for Behavior Analysis is to promote the science and theory of behavior analysis through the support of research, education and practice. We sponsor the top regional conference on behavior analysis in the United States and regularly feature well known researchers and clinicians from throughout the United States. We are the primary clearinghouse for research and training in behavior analysis in the Western Region of the United States. 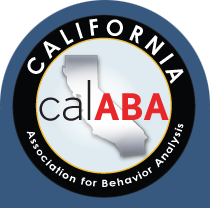 The California Association for Behavior Analysis was formed in 1998 when two organizations joined together: The Northern California Association for Behavior Analysis (NCABA) and the Association for Behavior Analysis and Therapy/Southern California (ABAT/SC). This award is presented to an outstanding individual who has exhibited exceptional leadership and advocacy skills in promoting behavior analysis by affecting policy, regulation, and/or legislation aligned with CalABA's mission and goals. Starting in 2013 this award is named in honor of Gerald Shook, founder and CEO of the Behavior Analyst Certification Board.